Circus Saudade is the webcomic I am the writer and illustrator for. It follows the story of a teenage girl named Gracie and her journey with the magical and dangerous Circus Saudade and its peculiar inhabitants. At its core, Circus Saudade is a coming of age story about Gracie. I am a thirty year old male, so putting myself in the shoes of a teenage girl, or any female role, isn’t always the easiest thing to do. Like with any character I create, however, it’s also something I feel a responsibility to take seriously and do well. It would be easy to shy away from putting ourselves in such positions; where the centers or our stories aren’t something close to us. As creators, however, it’s valuable for us to work from other perspectives. If our stories were only from our own lives and our own experiences, we would never make new stories. We would also miss opportunities to learn about other people and aspects of humanity. I’m enjoying telling Gracie’s story. I get to explore the victories, strengths, failures and evolution of someone who, I believe, is an extraordinary young woman. As someone who is decidedly not a young woman, there’s a great deal for me to learn there. What does strength look like in a teenage girl? What does failure look like? What about triumph? Can I learn something about myself through Gracie? 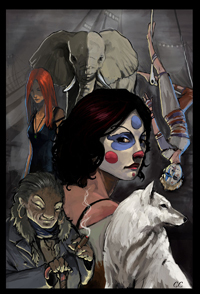 This piece is a painting of Gracie and some of the other important women of Circus Saudade. In a way, it’s a celebration of them, and another way I’m trying to get a deeper understanding of who they are and tell their stories with honesty and empathy.